Senior setter Ashley Lee on Monday was named the National Player of the Week after notching her 1,000th career dig and then recording a very rare quadruple-double. We will be having a free forum on getting home safely, pedestrian and bicyclist deaths, and how we can make our streets safer for everyone. With experts and advocates invited as part of our free Emphasize talk series, our next event will be held in the Bixby Knolls neighborhood of Long Beach on April 25. For more information, click here. Video footage courtesy of @chieflunes. Editor’s note: this piece contains descriptions of bodily harm caused by vehicles crashing into humans that can not only be disturbing to readers but copy that has been shared on previous stories. As reported by fellow writer and South LA advocate Sahra Sulaiman, a gathering of mourners who has lost friend and 22-year-old cyclist Frederick “Woon” Frazier were clear on their message: “The culture right now in LA—the car culture that we have—is not promoting life,” said Edin Barrientos to the approximately 150 cyclists, gathered to remember Woon after he was mowed down in a hit-and-run just a few days before. This marked the first of multiple incidents across South LA: according to Sulaiman, a pedestrian was killed at Figueroa and Imperial Highway. Or that later that night, a man in a wheelchair would be killed at Century and Main. Or that yet another cyclist would be run down at Century and Avalon the following night. 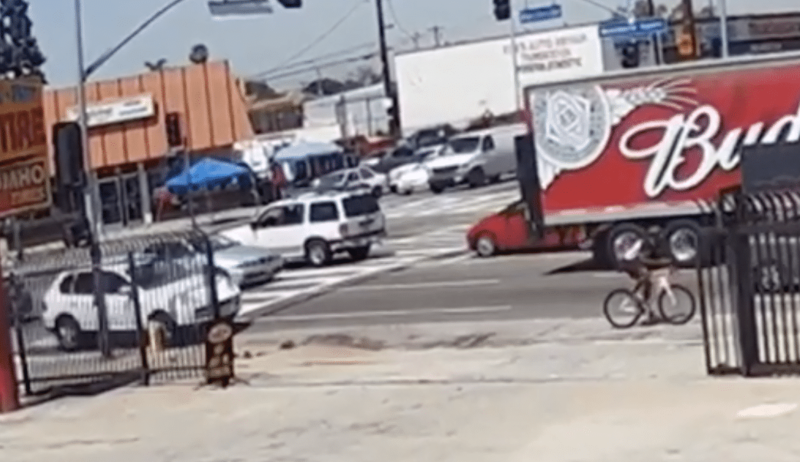 For the friends of Woon, killed while riding his bike near Normandie and West Manchester in Los Angeles, the footage of a nearby security camera released to the public is nothing short of harrowing. Woon had no chance of diversion. As shown in the video, a white Porsche SUV races up behind him while he bikes legally seconds before he loses his life on April 10. The suspect chose to propel their vehicle at such a velocity that it not only completely separated Frazier’s bike into pieces, but his body as well, shortly before fleeing the scene. Frazier [pictured] was hit hard and fast from behind just blocks from his home. His bike lies broken – the back end cleanly snapped off – some twenty-five feet back from where its rider came to rest. The handlebars are missing – likely torn off as the bike flipped and smashed into the ground at high speed. Ten or fifteen feet ahead and to the left of Frazier lie what appear to be the mangled remains of the back wheel intertwined with whatever was torn out from underneath the [vehicle]. The fact that the debris sits squarely in the adjacent lane suggests the driver probably watched the youth slam into the concrete and still decided the best course of action was to quickly switch lanes and maneuver around his body. It’s an incredible thing to contemplate, especially considering the driver must have had some awareness of the severity of the damage done: the skin torn off Frazier’s forearms; the powerful limbs wildly flung askew; a helmet resting quietly in a pool of blood – no match for the force with which Frazier’s head hit the ground; a mouth frozen open, as if in a silent, tortured scream. After that, many took to that same intersection to protest the young black man’s senseless death at the very intersection he lost his life. Their spirit, though driving the ire of drivers, was simple: if the street took the life of our friend, where else other than the street to protest? After scuffle with both police and other drivers, a woman in a Toyota Avalon felt it necessary to have them relive the moments of Woon: she turned around at the protest, garnered enough to distance to gather speed, ran a red light, and crashed into them. Police released a picture of the driver earlier this week in the hopes of finding her. As Los Angeles and Long Beach both seen upticks in pedestrian/bicyclist-related deaths and injuries —in one of the more recent local incidents, a 13-year-old girl and 12-year-old boy, both siblings, were struck while riding their bikes in East Long Beach—the need for Vision Zero policies are becoming an essential part of the advocacy discussion. The Vision Zero project is simple: to achieve a highway and arterial system with no fatalities or serious injuries in road traffic. It started in Sweden and was approved by their parliament in October 1997. Sweden has since cut their traffic fatalities dramatically even as the number of vehicle miles traveled has increased. When looking at safety on the streets, not all travelers are created equal—and that’s precisely the focus of our discussion on pedestrian and bicyclist deaths as we continue our free talk series, Emphasize. This free, public forum on Wednesday, April 25, at The Kids Theatre Company in Bixby Knolls, will welcome safety expert and Vision Zero Policy & Communications Director Kathleen Ferrier. Some ways that cities can create Vision Zero policies are by designing streets for all modes, increasing funding for bicycle and transit projects, focus law-enforcement at high-risk activities and high-danger corridors and, perhaps most importantly, finding ways to slow-down car traffic. Longbeachize has been no stranger to inviting Vision Zero U.S. experts to speak in Long Beach, having invited its current Executive Director and Founder Leah Shahum a few years back. This time, however, it is more than just getting Long Beach to formally adopt Vision Zero policies. It will be an emotional and data-driven conversation that looks how society in culpable in these tragedies and the uneven attention we provide to other sources of tragedies. For example, we will look into how the priority given to cars in our public spaces provides them power over people on their feet. We will look at media’s role in perpetuating that power, as well as policies which do the same. Even more, we will be asking why we aren’t paying attention to what is essentially a crisis. Following the success of our previous Emphasize events, we will continue hosting these face-to-face conversations that invite some of the nation’s leading experts on complex topics to talk to Long Beach one-on-one. Our talk on this issue will precede two more future talks on gentrification and urban design. The discussion, as with all Emphasize events, are entirely free and open to the public. For more information, click here.